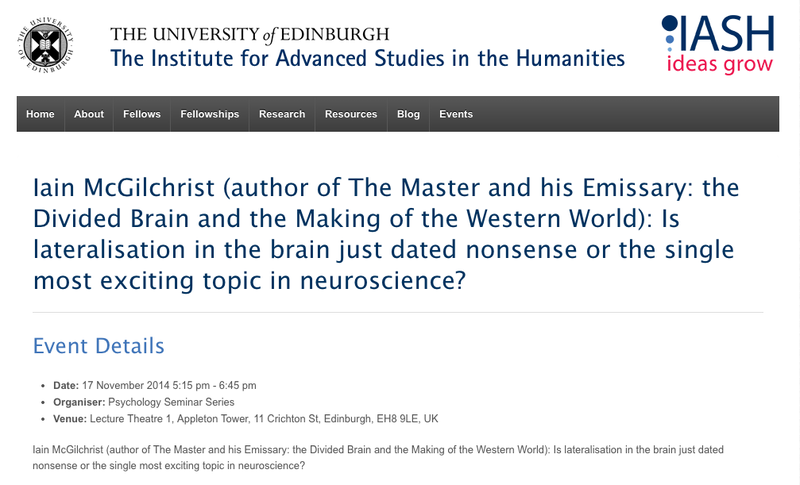 I was fortunate to be able to attend this public lecture by Iain McGilchrist at Edinburgh University yesterday evening. The lecture can’t have been easy for McGilchrist, since he had a diverse audience ranging from novice to expert across various disciplines. He couldn’t assume that everyone knew the key ideas presented in his book, ‘The Master and his Emissary: The Divided Brain and the Making of the Western World’, and therefore needed to cover this for novices, whilst at the same time presenting more challenging ideas for those very familiar with his book and work. From my perspective, the lecture was well worth the journey from southern Cumbria. These types of views which pit left brain against right brain, have now largely been discredited and McGilchrist is at pains to point out that both hemispheres are involved in everything. 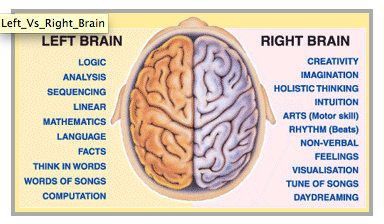 For example both the right and left hemispheres have a role to play in creativity. Nevertheless, he is also clear that his interest lies in the differences between the two hemispheres. After all, it is a physical fact that the brain as an organ is divided down the middle and is asymmetrical in just about every way you can think of; there definitely are differences. McGilchrist knows from his work in psychiatry that problems of symmetry are central to human dysfunction and there is a tension between the work of the left and right brain. This tension is one of attention, which is so well depicted in this RSA Animate video. Attention is a type of awareness and has to be conscious. There are two kinds of attention. We have to be able to focus with a lot of attention, but also be able to maintain wide open uncommitted attention. The former type of attention is the attention of the left hemisphere (LH) which gets things and manipulates them and controls with a grasping hand (‘I’ve grasped it’); the latter is the attention of the right hemisphere (RH) which sees the bigger picture and how complex life is. These differences are consistent across many domains, such as music, morality, language and all the domains of experience, and have been evidenced in scientific research of various types, e.g. work with stroke victims. Details of some of this research can be found in McGilchrist’s book. McGilchrist’s interest is in how the two hemispheres interact, in the nature of interhemispheric relations and the asymmetry of interhemispheric inhibition. Why? Because he believes that in this modern age there are increasing pressures to adopt a LH mode of thinking possibly to the detriment and neglect of the RH and for him this is history repeating itself. He pointed out that the Greek, Roman and Renaissance periods all had the left and right hemispheres working beautifully together at the outset, but over time, as these cultures developed empires and became more bureaucratic, dealing with things remotely and in abstraction, moved towards LH dominance. And what happened to these cultures? They ultimately collapsed. And all this is accompanied by a dangerous optimism that we are doing the right thing. Clearly we are not learning from history. So McGilchrist’s main message is that we are at risk of allowing the LH to dominate and we neglect the work of the RH at our cost. The Master (the RH) sent his Emissary (the LH) out to do his work, but his Emissary has taken control, believing that he no longer needs his Master and has betrayed him. McGilchrist is now turning his attention to how this might impact on our education, schools and universities and is in the process of writing a book about how science and education are becoming increasingly left brained. The title of the book will be The Porcupine is a Monkey. Although Iain McGilchrist no longer intends to publish a book bearing the title. The Porcupine is a Monkey, the relevance of his ideas for education remain of critical importance. This is my response copied from https://jennymackness.wordpress.com/about/#comment-15834 where Bruno originally posted the question. If we accept that reality is paradoxical and that we need both precision and vagueness, restriction and openness, ambiguity and clarity, uncertainty and certainty (a both-and rather than an either-or mentality) (https://jennymackness.wordpress.com/2016/09/02/exploring-the-divided-brain-creativity-paradox-and-negation/) then this must have implications for education, don’t you think? Our curricula tend to shy away from these paradoxes, presenting ideas as ‘known’ and ‘fixed’, ‘testable’ and ‘measurable’, with ever increasing emphasis on STEM subjects and ever declining emphasis on the humanities. Recently I find myself thinking more and more that there is a real need for more study of philosophy in education. https://jennymackness.wordpress.com/2015/03/29/the-divided-brain-and-the-power-of-no/) Maybe this is the direction in which education needs to go. For me Heraclitus’s belief in the unity of opposites, that everything fits together in a relationship of tension, that oppositional forces enrich, might be a good place to start when thinking about how education might need to change. Thankyou so much for your question which I think is so pertinent to education today. If you don’t mind, I am going to copy it and my response to my blog post about the implications of Iain’s work for education – https://jennymackness.wordpress.com/2014/11/18/the-divided-brain-implications-for-education/ – where maybe more people will see and think about your question. Wow … what a great response! Thoughtful, detailed and quick! I’m more than happy for you to copy my question into your blog. I’ve read quite a bit of your blog so far and feel that I have found a kindred spirit. I will email Iain McGilchrist with regards to paradoxical thinking. 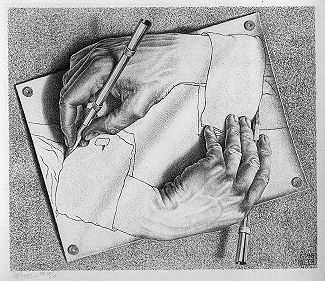 Is paradoxical thinking a solution to the human condition? I created this video in an effort to “work from the bottom up” (as Iain states) … to affect change. Then I created the follow up video in an effort to present an example of how I use it. And it was very difficult to do and as your quote from I. Berlin states: I wish to convey something immaterial and I have to use material means for it. I have to convey something which is inexpressible and I have to use expression. I have to convey, perhaps, something unconscious and I have to use conscious means. I know in advance that I shall not succeed, and therefore all I can do is to get nearer and nearer in some asymptotic approach; I do my best …. It is a video I created to make learning fun and easy. I used paradoxical thinking techniques in making it. I didn’t put it into Youtube … a teenager from the United States did … I just haven’t done anything about taking it down. Why? That’s another post for another time. I found it interesting that paradoxical thinking is being used in big business. Feel free to post my response into your blog as well … if you think it may cause others to think more about paradoxical thinking as this is definitely my aim. This week, the research project has been a lot of fun. Loads of activity with everyone throwing in their ideas. I don’t usually like chaos and confusion, and I’ve had to spend hours today going through everything on the wiki to check whether my understanding is correct (if only I didn’t have a memory like a sieve! ), but it has been stimulating and enjoyable and not as chaotic as it might at first appear. One of the fun things we are doing in this research project (investigation into people’s preferences in the CCK08 course for communicating in blogs or forums), is to examine ourselves as researchers as we go along. John puts up tests and charts for us to fill in. We have created a folder on the wiki for research reflections and these activities go in there. We started in quite serious vein examining our different perspectives on whether we have agreed the research questions, whether we have clear goals, open communication, support each other and so on – we did pretty well on that one although there were some different perspectives, but we did establish that we regard ourselves as a good team. (The team is made up of me, Sui Fai John Mak, Matthias Melcher and Roy Williams). So in the spirit of John’s example, I followed the link on Viki Davis’ blog (pointed out by Matthias) to find out what kind of blogging styles we have and this is what I found out. The thoughtfully creative and empathetic type. They are especially attuned to thinking up new and better ways of helping people get their needs met. They can be fiercely independent and can work tirelessly to achieve their goals. They often need a friendly reminder not to take themselves too seriously and enjoy the process as well as the achievement. They like working in an environment where they can set goals and help people grow. Since they often are so good listeners and have strong integrity they often end up very appreciated leaders. The long-range thinking and individualistic type. They are especially good at looking at almost anything and figuring out a way of improving it – often with a highly creative and imaginative touch. They are intellectually curious and daring, but might be physically hesitant to try new things.